_After the Battle_ features a wide variety of new Australian works for the recorder ensemble as well as a few from the Renaissance, Baroque and Traditional Irish. Composers include Joseph Bodin de Boismortier (1689-1755), Miggs Coggan, Lance Eccles, Tony Lewis, Richard Peter Maddox, Diego Ortiz (c.1510-1570) and Benjamin Thorn. _After the Battle_ is the title of Batalla Famossa~~~~~s second CD. Their first CD, _The Great Emu War_, also carried a title that made reference to the military metaphor. As if almost in contrast to the title itself, however, the CD displays no conflict amongst the musicians; rather it reveals a cohesive ensemble technique by a group of extremely competent musicians. Nonetheless, if the metaphor of war can be taken a bit further, clearly the CD resents a triumph by the performers, composers and director; a triumph worth celebrating like a victorious end to a battle. The performers on the album _After the Battle_ are: Karyn Ashley, Todd Ainsworth, Anna Christensen, Sarah Coggan, Tilly Pamment, Rhia Parker, Tom Stayner, Erinn Thornton. After the Battle features a wide variety of new Australian works for the recorder ensemble as well as a few from the Renaissance, Baroque and Traditional Irish. Composers include Joseph Bodin de Boismortier (1689-1755), Miggs Coggan, Lance Eccles, Tony Lewis, Richard Peter Maddox, Diego Ortiz (c.1510-1570) and Benjamin Thorn. After the Battle is the title of Batalla Famossa's second CD. Their first CD, The Great Emu War, also carried a title that made reference to the military metaphor. 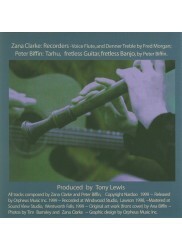 As if almost in contrast to the title itself, however, the CD displays no conflict amongst the musicians; rather it reveals a cohesive ensemble technique by a group of extremely competent musicians. Nonetheless, if the metaphor of war can be taken a bit further, clearly the CD resents a triumph by the performers, composers and director; a triumph worth celebrating like a victorious end to a battle. The performers on the album After the Battle are: Karyn Ashley, Todd Ainsworth, Anna Christensen, Sarah Coggan, Tilly Pamment, Rhia Parker, Tom Stayner, Erinn Thornton. After the Battle is the title of Batalla Famosa's second CD, recently launched at the New England Regional Art Museum. Their first CD, The Great Emu War, also carried a title that made reference to the military metaphor. As if almost in contrast to the title itself however, the CD displays no conflict amongst the musicians; rather it reveals a cohesive ensemble technique by a group of extremely competent musicians. Nonetheless, if the metaphor of war can be taken a bit further, clearly the CD represents a triumph by the performers, composers and director; a triumph worth celebrating like the victorious end to a battle. Batalla Famosa is an ensemble of young recorder players from Armidale, NSW under the direction of Zana Clarke. The ensemble plays works from the full spectrum of repertoire available for the recorder. Not surprisingly, the pieces on this CD demonstrate an incredible variety of sounds for the instrument including works from the Renaissance as well as the present-day. Consequently, the CD is not only a celebration of the performers' efforts, but also that of the composers who wrote works specifically for the group. Richard Peter Maddox's Post Proelium Deliberemus (Deliberation after the battle) takes up the theme of war throughout its three movements. Movement one begins with a brief taste of the chaos of battle before intoning a triumphant dance-like victory procession. The recorders and drum lend it a medieval feel while the asymmetric rhythmic design and non-triadic harmonies give it a quirky twentieth century mood. Movement two, Deliberatio, places a sedate ostinato chordal figure against individual melodic lines as if to deliberate over the battle's end. The work then ends with the exuberant third movement, Laetitia, which creates the sound image of joyful victory celebrations. Benjamin Thorn takes a significant role in the production of this CD through his contribution to three works. 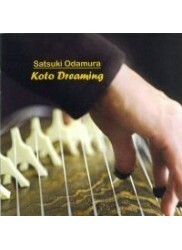 His own composition, Deep Sea Perspectives, begins the CD. The composer has that habit of throwing something quirky and humerous at you just as things begin to sound familiar. You think you are in the 16th century when suddenly you realise you have jumped a few hundred years forward in time. 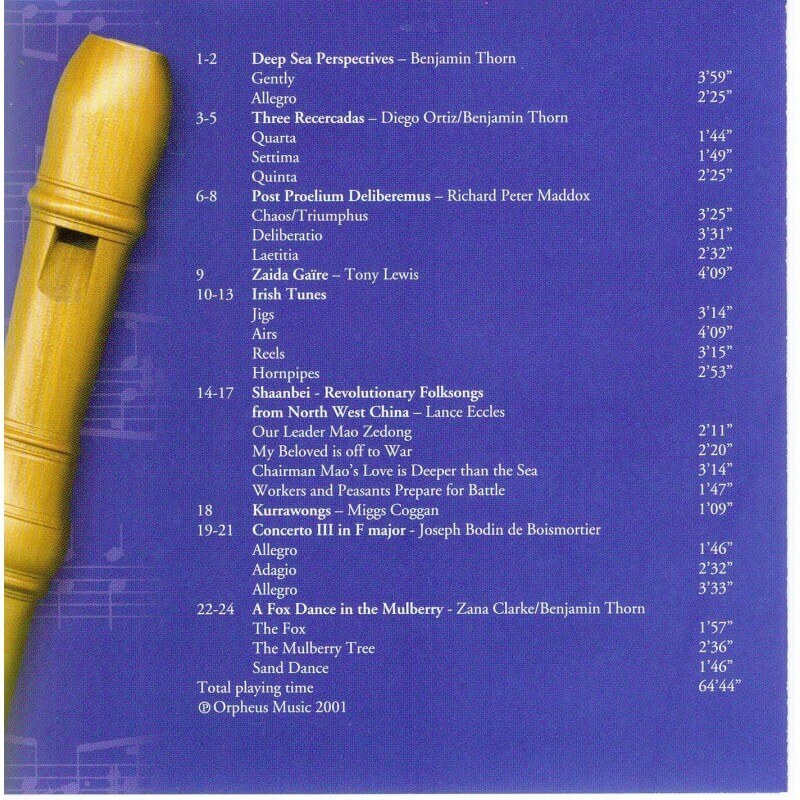 However, an even stronger reference to the Renaissance is made through the second work on the CD in which Thorn takes three Recercadas of Diego Ortiz and adapts them for the recorder ensemble. The more standard modal polyphonic writing one would expect to hear from an ensemble of recorders is evident in these works. Repetitive harmonic progressions of a Renaissance dance show through, as do complex polyphonic interlocking parts. Dancing again becomes a theme in the last work on the album, A Fox Dance in the Mulberry , this time jointly arranged from traditional melodies by Benjamin Thorn and the group's director, Zana Clarke. In many ways the melodies resemble the more recognisable Irish Jigs, Reels and Hornpipes recorded earlier in the album. Irish music fans will love these items. Imagine having eight whistles playing all at once rather than just one or two! The effect is quite astounding and should have you up and dancing in seconds. Three other culturally diverse works make up the rest of the album. They provide for a variety of sound images which serve to stretch the ensemble's repertoire beyond the norm. Tony Lewis' Zaida Gaire is a fascinating mix of Africa and medieval Europe. Hocketing, reminiscent of the music of Central Africa as well as composers such as Machaut are created through a labyrinth of interlocking ostinato patterns resulting in a wonderful fusion of sounds. Coming from the other side of the world are the arrangements by Lance Eccles of Revolutionary Folksongs from China. Here perhaps, Batalla Famosa reveals its most homogeneous texture. Through a unique textural blending of all the instruments, the work sounds remarkably like the Chinese instrument on which the works may have originally been performed. By contrast, the sound texture of Miggs Coggan's Kurrawongs blends a variety of repeating melodic lines to give the image of those birds Australians know all about. The last word belongs to the performers themselves, all of whom are young Armidale musicians with considerable talent. Though the membership of the group grows and changes yearly, the direction of Zana Clarke will undoubtedly continue to inspire an impressive array of sounds through a diverse and eclectic repertoire. We look forward to their third CD whenever the famous battle resumes again!